Table Top Panel Display 6 Ft.
Table Top Panel Display 8 Ft. 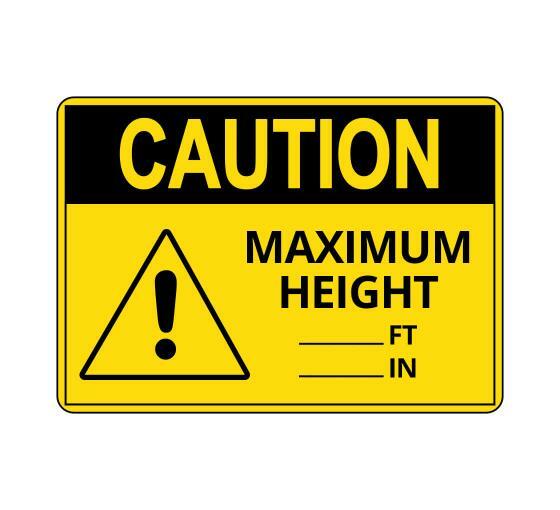 This OSHA CAUTION Maximum Height ft in Sign with text and symbol makes your Clearance & Floor Capacity message clear to employees, visitors - and inspectors. Clearance and capacity warehouse signs communicate maximum height and weight requirements to employees and machine operators in your warehouse. Wherever there's Low Clearance overhead, safety is always a concern. Fortunately, posting signs about Low Clearance hazards reminds everyone in your facility to be cautious and follow established safety procedures. Clearance signs warn employees of areas with low clearance, low pipes, and low headroom. Maximum capacity signs alert workers and truck drivers of the maximum capacity of particular vehicles or in certain areas of the warehouse. Place clearance and capacity signs in shipping and receiving areas, basements, and anywhere a low ceiling or weight limit is an issue. BannerBuzz offers a wide variety of other warehouse safety products that will protect your employees from dangerous accidents. Choose from a large selection of clearance and capacity signs we have in stock and ready to ship today. 0.40-in. mounting holes in each corner. Based on your shopping style, we’ve curated a product catalogue, just for you. Hope this helps! Write to usFor your questions, we’re just an email away. Add us on social media? © 2009-2019 bannerbuzz.com All rights reserved.